When I saw the water leak inside the Caravel several weeks ago, I knew I was in for it. But I had no idea it was going to be this bad. 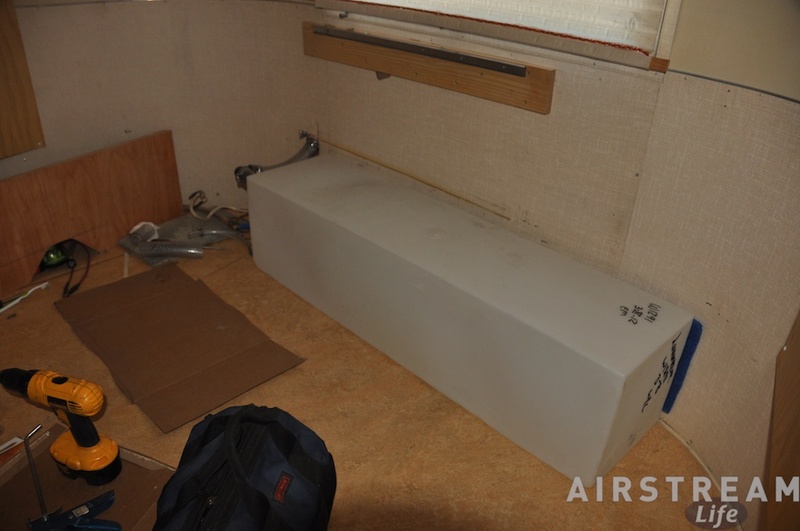 You might recall that back in early October we discovered that the fresh water tank in the 1968 Airstream Caravel was seeping water and had damaged part of the Marmoleum floor. This incident put me on Full Alert status, because the trailer had been extensively renovated. The Marmoleum floor covering and the plywood subfloor were pristine, and all the woodwork was made new from birch with my own hands. I had a lot invested in that trailer (both time and money) and the sight of a water leak was a dagger to my heart. Water is the #1 killer of Airstreams. After freaking out for a few minutes, I removed the dinette to assess the damage. The birch was mostly OK thanks to multiple coats of polyurethane, the Marmoleum was lifted (the underlying adhesive had failed), and the water tank was irreparable. Those of you who have been following this saga know that I tossed the tank and ordered a new one, re-glued the floor and mashed it back down with a few hundred pounds of rocks, and fabricated an aluminum threshold to pin the flooring edge. I also sealed the perimeter of the floor covering with tan silicone caulk. That all went well, and now it’s hard to detect that anything ever happened. The problem of the past week has been installing the new water tank. I ambitiously ordered a 12x12x48 polyethylene tank, which is slightly larger than the original. This by itself just meant I had to trim a little bit of wood here and there, and fabricate a new piece to hold the tank in place. No big deal. The problem came from my failure to request a vent on the tank. See, the tank is standard-sized but you can have threaded fittings spin-welded anywhere into it. I requested two on the left side: one large fitting at the top for filling the tank, and one small fitting at the bottom for draining it. Logical, right? So I popped the tank in place, hooked up some hose, and we tried to fill it with water as a test. With no air vent to release the pressure inside the tank, water wouldn’t go into the tank any faster than a weak dribble. Try to fill any faster and water would just burp out the fill opening all over you. I realized my mistake immediately, but what to do? I could have taken the tank around town and found someone locally with spin-welding capability to have a vent added in, but that seemed like a major hassle. Besides, there was no clearance above the tank to fit a vent on the top. The highest point I could fit a vent was equal to the fill point, which meant that when the tank was full, water would come out the vent. That meant I had to find a way to route the vent tube outside, which likely meant cutting a hole in the trailer somewhere. I wasn’t keen on that. So thereby began a process of trying to outsmart the laws of nature. I dreamed up all kinds of clever ways to vent the tank at the fill hose where it met the tank. Unfortunately, my clever solutions inevitably resulted in a frothy water/air mixture bubbling up the ad hoc “vent” and plugging it, at which point the tank would have no functioning vent and we’d be back to the original problem. Worse, that plug of water would then be forced up the vent hose (by air pressure building inside the tank) and eventually spit out inside the trailer somewhere. I literally went to bed at night thinking of ways to solve this problem, and woke up in the morning with fresh ideas—which also didn’t work. Every day I went to the hardware store to buy a handful of brass bits, hoses, PVC pipe, and various other plumbing supplies, which I would assemble in the trailer and test. I now have a small Museum of Failed Plumbing in the trash bin. I actually did design a water/air separator that would have worked, but there wasn’t sufficient clearance above, since the dinette seat covers the entire area. After three frustrating tries, and about six trips to the hardware store, Eleanor suggested something much more clever. “Why don’t we just turn the tank so the drain is at the top?” I glared at the tank for a moment, and suddenly realized she was on to something. By rotating the tank 180 degrees, the large fill opening would be at the bottom, and the drain would be at the top, thus usable as a vent. There’s no problem filling a tank from the bottom as long as the top of the tank is below the entry point, and with a little plumbing I could also use that same bottom connection as the drain. You can see the solution in the photo. After this I figured I was home free, but no. The next big surprise was that the new tank bulges when full. I hadn’t anticipated that either. The old tank had thick walls and was essentially rigid, but modern poly tanks are thin-walled and very flexible. When I dry-fitted the wood cover and filled the tank to check for leaks, the wood was forced off by the bulging of the tank. The solution here was to add reinforcement to the tank cover to resist the weight of 225 pounds of water trying to push the walls out. 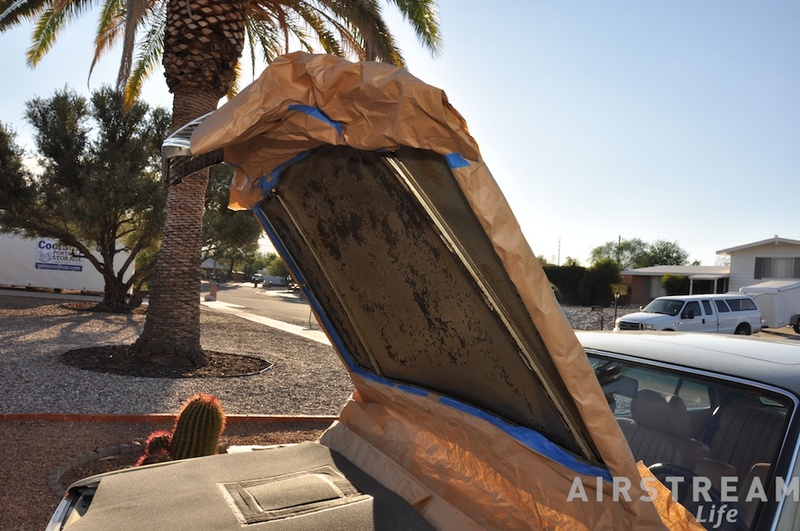 I could have fabricated a new tank cover to accommodate the bulge, but that would meant a search for 1/4″ birch plywood (much harder to find here in Tucson than in wood-happy Vermont) and a few days of cutting, staining, and finishing. At this point I’d been working on the tank problems for a week and I was looking for a way to get this job done. So I added braces and extra screws and I think it will hold up. If not, I have a backup plan involving some aluminum L-channel. At this point I think I have about 25 hours of work into this “little problem” caused by the original tank leaking. Admittedly, I didn’t just set out to fix the primary problem. I also wanted to improve a few things along the way, like the floor edge sealing, the threshold, and some woodwork details. But it was amazing how that stupid little leak in the tank ended up taking over my life for the past week. The furniture is back in the trailer now, but the job’s not done. I want to reduce the weight of the dinette table by routing out some of the underside wood. The table was re-made by some well-meaning friends who used 3/4″ plywood, and as a result the table is so heavy it takes two people to lift it out (to convert to a bed). I also need to sanitize the fresh water system with bleach, and I think I may go find the spot where the plumbing makes a loud vibrating noise when the water pump is running, and find some way to silence it. Whether I get to those jobs this week or not, the trailer needs to get out of the carport and back into off-site storage soon. The Safari’s floor makeover is languishing until I have more carport space, and the Mercedes 300D wants some love too. I’ve got about another six weeks of really fine Fall weather in Tucson to get my projects done, so there’s no time to waste. I’m just hoping that the next few things go more smoothly than this “little problem” with the Caravel. I did say this was “project season,” didn’t I? Between the house, the Caravel, the Safari, and the 300D the list of jobs seems endless, so I’ve resolved to just tackle one item every single day without fail. It’s like chipping away at a mountain, but chipping a little at a time is the only way the mountain will disappear. The 300D project has gotten the most attention. On Tuesday we replaced the bumper rub strip. On Wednesday I replaced the rear sway bar links and inspected the rear brakes. On Thursday Eleanor and I installed a new hood pad. 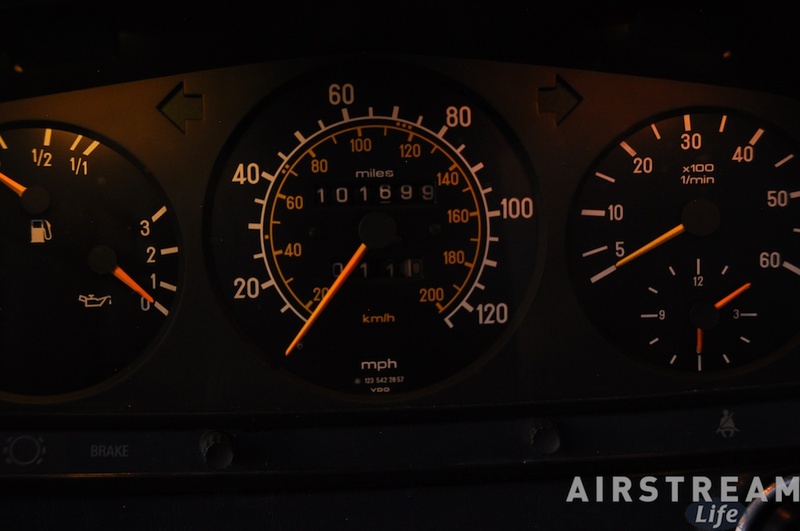 On Saturday I removed the instrument cluster and fixed the dim lighting, along with the inaccurate temperature gauge. I used two T-10 LED lights from LED4RV, which really helped to reduce heat in the cluster. (The plastic was beginning to melt from the hot old bulbs.) On Sunday I very carefully removed an old decal from the defroster glass, a tricky job without breaking the silkscreened defroster elements. In between 300D jobs I continued plotting the rest of the car’s resurrection, researching parts and repairs. On Friday I got brave enough to remove the heaps of flagstone and slate that were pressing down the Caravel’s damaged Marmoleum floor. It had been baking in the heat for the last week or so. It appears that the silicone caulk is working well as floor adhesive. As I feared, the floor is not lying perfectly flat —there’s a small lifted spot— but it’s good enough. Eleanor came up with the idea of fabricating a trim strip to hold the Marmoleum in place, and so I cut a piece of flat aluminum to size, cleaned it up with a Scotchbrite pad and orange cleaner, drilled three countersunk holes for stainless screws, and then sprayed it with clearcoat. Beneath the trim I sealed the edges of the Marmoleum with tan silicone caulk. The dimensions of the aluminum were chosen to match the trim already in the trailer, and I think it looks great. The three screws are pinning the floor in place. The next job on the Caravel is to get the new water tank installed. I got a start on this Saturday, but decided to take a break in favor of other projects. I think, barring unforeseen problems, that we’ll have this wrapped up in the next couple of days. The tank is mostly plumbed in, and the rest of it is just reinstalling the furniture, testing for water-tightness, and sanitizing the system. The Safari hasn’t gotten much love lately. I bought the rest of the flooring material but we really can’t get on that project until the Safari’s little sister gets out of the way. That should be an interesting one though, as we’ll be removing most of the bedroom, the dinette, and other stuff. The house always gets the shortest stick. All it got this week was a repainted exterior light yesterday, and a new dryer vent on the roof this morning. The many other house projects are just going to have to wait. For some reason it’s more gratifying to work on the vehicles! The Airstream work has come to a momentary halt, while we wait for the Caravel’s floor to settle down. We’re giving it several days in the heat (yes, it’s still hot here) with the hope that it will flatten and stay flat. Until we feel brave enough to pick up all the slates and flagstones we put on it, we can’t do much else. The Safari is on hold too, because the Caravel is taking up all the working space. So for a while I’m focused on Mercedes work. The old 300D is in the driveway now, and we’re getting to know each other. A few things have revealed themselves already, primarily that the car has “good bones” as they say, and yet it needs a lot of work to get back to the level of performance that it should deliver. This is the process of “sorting out” a car. I’ve mentioned this process before, but never really documented what it takes. So, for Mercedes fans and my old-car friends, I’m going to get into the gory truth. First of all, you have to throw away any concept of financial logic. The end result of this will be more expensive than a good used Honda, but the goal is not just to have reliable wheels. It’s to have a 1984 Mercedes on which everything performs to the original factory specifications. That’s a good definition of “sorting out” a car, too. Pierre Hedary, a 20-something & fast-rising Mercedes expert who operates a shop in Florida, presented a seminar last weekend in Phoenix at the Mercedes Club of America’s biennial “Starfest” conference on that very topic. I’ve known Pierre for a few years, and have a lot of respect for his knowledge about Mercedes. So I listened carefully as he talked about how he sorts out a car for a client. It’s a methodical, intelligent approach that in the end saves money by fixing up the car in the most efficient manner possible. You don’t do things willy-nilly, you don’t fix only what’s broken, and you try to touch each system of the car only once. My first few days with the 300D were not encouraging. The paint was rougher than I’d expected, and the tires were also. I got $200 back from the seller for the tire issue. The next day the air conditioning quit (fortunately just a loose connector). The day after that I changed the air filter (filthy) and then the cruise control quit. The next day I changed the engine oil and filter and then discovered the instrument cluster lights were out. The next day the rear rubber strip on the bumper fell off. I researched the proper technique for re-attaching it, and Eleanor & I fixed it that afternoon. It felt at times like I was chasing the car and putting parts back on it as they fell off. All of this was really just a sideshow, because meanwhile I was working with Pierre via email to diagnose all of the more serious issues, and develop an action plan to resolve them. This is the key: knowing everything that needs help, prioritizing all the problems, and categorizing them so that you know exactly how to get the car back up to snuff as efficiently as possible. I drive the car daily, making notes of un-Mercedes-like behavior, and take photos where possible so that Pierre can comment on the issues and possible solutions. See, people expect crummy behavior from an old car. “You paid $xxxx for it, what do you expect?” But this particular chassis has a 30+ year history that proves the capability to run just as good as new, for hundreds of thousands of miles, with appropriate maintenance. It should glide over the roads with nary a squeak or rattle. It should start readily with just a touch of the key, and idle like a purring lion. The climate control should be precise and automatic. The transmission should shift smoothly. Most of all it should be entirely reliable, so much that you’d never hesitate to climb in for a 3,000 mile roadtrip. But so few do any of those things, because most have been let go by people who believe it’s a better choice to “drive the car into the ground” and then buy another one when it’s beyond repair. Maybe that’s true of a lot of cars, but not all cars were made to be disposable. This one, among many other quality vehicles from days gone by, is from the era where buying a top-brand car meant you were buying an heirloom worth maintaining. Today mine drives “fine, for an old car,” but when we are done it should drive like a new 1984 Mercedes—and still cost a fraction of any new Mercedes. I think this is the same instinct that makes people over-invest in old Airstreams. You just know that they are too good to let fall apart, even when the cost of restoration far exceeds the price of a new one. So far we’ve identified issues with numerous gaskets, the steering box, the cooling system, the climate controls, lights, switches, vacuum system, and brakes. 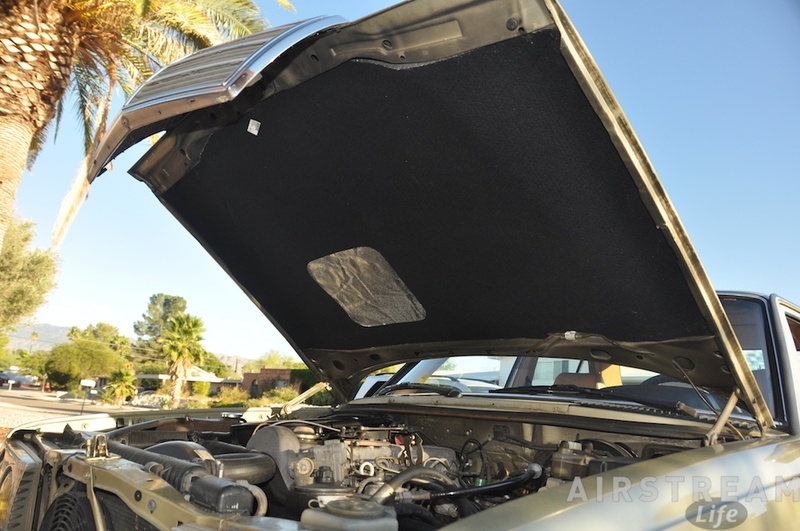 All of the fluids and filters need replacement, and the valves need adjustment. The air conditioning needs some tweaking in order to meet the challenge of a southern Arizona June. Many things on this car have been allowed to go out of spec or gradually approach failure, without maintenance. So the list is long, and intimidating. It’s been almost a week since I started the diagnostic process. The action plan is nearly final, and I’m developing lists of the parts and tools we’ll need to actually do the work. Later this month or in early November, Pierre is going to fly out here and spend a few days working on the car (and spending his nights in the Airstream guest house). If everything goes well, a few days later he’ll leave behind a car that is properly sorted out. That should be an interesting week indeed, and I’ll definitely be blogging about that. Since this is our “off season” for Airstream travel, we’re getting on to maintenance projects in the Airstreams. The 1968 Caravel has taken precedence, by virtue of springing a leak. A few years ago we replaced the subfloor in the Caravel and put a Marmoleum floor atop it, which I figured would last a long time. Marmoleum is great stuff, although hard to install in a trailer. Stored under cover, in the desert, it seemed unlikely that the floor would be water-damaged, but that’s what happened, right here in our carport. The original plastic water tank began seeping water at a brass fitting (a fitting which has no purpose that I could glean). The seepage was so minor that it was unnoticeable until it had leaked for a few weeks. I went into the Caravel for a quick inspection and stepped into a puddle of water right at the entry door. By then the wood subfloor was saturated with water, which caused the floor adhesive to fail, and allowed the Marmoleum to lift off and warp. Most annoyingly, the water puddled entirely at the entry door where the damage would be most visible. We had quickly disassemble the dinette, and lift the Marmoleum an inch at the edge in order to dry out the subfloor. Even in our dry season, with outdoor humidity running about 15-20% during the day, it took over two weeks to fully dry out the wood. In the meantime I consulted Colin Hyde and he warned me not to try to fix the water tank, as it was likely to fail again due to age. I didn’t need much convincing. The old tank was riddled with various plugged holes for tank monitors (unused), drains, and who-knows-what. In the photo you can see the the old brass fitting that was the cause of our problem. The white crusty stuff around the edges is probably dried minerals, and you can also see a split forming in the tank itself (barely visible at the 5 o’clock position). So I bought a new tank from Vintage Trailer Supply with custom inlet and drain threads “spin welded” in place exactly where I wanted them. The new tank is a little larger than the original, with a 28 gallon capacity, but it fit into the same space with just a little modification to the wood dinette that surrounds it. I had to trim one edge of the lower storage compartment’s face frame, and fabricate a new wood piece to hold the tank in place. Once installed, the new tank will be much easier to service because it can be positioned to avoid the outside water fill tube, and thus plumbing access will be straightforward. The other one partially blocked the water fill tube, so it was a real pain to connect. I’ve had to take that connection apart three or four times in the past because the water fill kept leaking, so I’m glad to see it go. The new tank will have much cleaner connections that are under less stress, and the tank itself is less likely to leak since it has only two openings (fill and drain) and I’m using all new plumbing. The threads will get Teflon tape, too. I’m not so sure about the Marmoleum. It got pretty warped in the drying process, and a tear formed at one point. We have attempted to re-attach it to the floor using tan silicon caulk. To flatten it, we’ve stacked a few hundred pounds of leftover slate tiles and flagstone, with a base layer of corrugated cardboard. I’ll let it sit that way for a few days while the fall desert heat bakes it, and then see if we’ve had any luck. If not, we’ll have to scab in a patch. We can’t do much else inside the Caravel until the floor is fixed, so our attention is turned to the Safari. A few weeks back I had announced an ambitious plan to face-lift the interior, but reality (meaning budget) has prevailed. So we’re going to stretch out the work, and just start with the flooring. 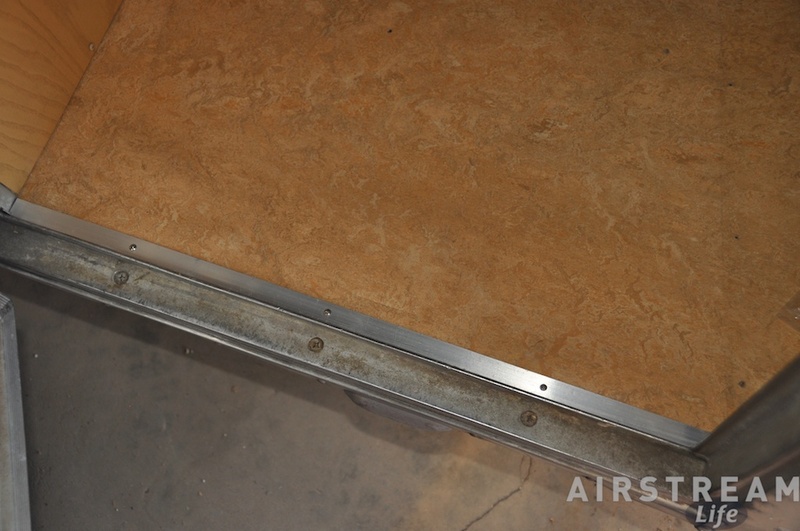 John Irwin wrote an article about flooring replacement options, which will appear in the Winter 2012 issue of Airstream Life. Inspired by this, I began to look at quality vinyl planks and discovered that there are some really nice options, and they are cheap, easy to install, and will go right over the existing vinyl floor. We’ll remove the dingy old carpet in the bedroom and put the vinyl planks there, too. Eleanor and I bought some of the flooring today to do a test layout in the Safari, and it looks good. I expect we’ll take a few days to complete the job, including time to pull out the furniture, prep the existing floor, cut around obstacles, and reinstall the furniture. We will get on that job after the Caravel is done and back in its off-site storage spot. We need extra space in the carport for all the furniture that we’ll be removing from the Safari. I really don’t have any particular love for flooring work but, like painting, it is gratifying when it’s done and everything looks great. And we’re entering the season of perfect daytime temperatures for outdoor work, so I’m looking forward to tackling the Safari floor soon. The Hunt is done once again. I had mentioned on September 14th that I was looking for another Mercedes 300D (a diesel car from the early 1980s), to replace the one that I sold two years ago. After I’d sold it in a moment of weakness to a buyer from Connecticut who wanted a rust-free southern car, that black Mercedes stuck in my memory. I began to miss the way it elegantly glided over the cracked urban roads of Tucson. I missed the reassuring soft clatter of the engine (which is not loud when the car is properly tuned and the sound-dampening hood pad is intact). I missed the simplicity of it. And so I started a quest, a hunt, to find a fine example that—this time—I would keep. It’s hard to explain why this particular car appeals to me. I think that if you are the sort of person who is inclined to be interested in old cars, you naturally gravitate to something you remember from childhood. I know I get a lot of letters from people who tell me that their interest in Airstreams started when they saw one on a family roadtrip. I know a friend’s family had one of these when I was a teenager, but it was blue inside (my least favorite interior color) and decaying with Vermont rust, so it wasn’t a particularly attractive memory. It’s a car that defies contemporary values. It’s not fast and it’s not powerful. The turbo engine produced a mere 120 horsepower when it was new, and worn ones undoubtedly produce quite a lot less. It was well equipped for the time, with power windows, automatic transmission, automatic climate control, central locking, cruise control, and many other features for the US market, but by today’s standards it is virtually gadget-free. Our economy car, a 2007 Honda Fit, has almost all the same features and nobody thinks that’s any great accomplishment. Where’s the 220-watt stereo with MP3 input? Where’s the trip computer? Where’s the sleek tapered nose? I don’t care about any of that stuff. The upright and sturdy look of the old Mercedes W123 chassis has an indefinable appeal, for me and a few other fans. The lines are clean without being the same boring aero shape of virtually every modern car today. The interior is comfortable without being plush, and the appointments are restrained and dignified without being pretentious or Spartan. And the body, despite lacking airbags and anti-lock brakes, is safer than many cars that came after it. This car comes from an era where engineers ruled Mercedes. Everything about it yields a sense of mechanical durability, thoughtfulness, and quality. Even a little thing like the sound of the door closing: a muted, brief, THUNK. I’ve seen guys at car shows demonstrate the door sound to their friends. Nobody ever does that with a Porsche or Jaguar. You might say that nobody buys a car because of the way the door sounds, and that’s probably true, but it’s just an audible hint of the level of detail that a bunch of German engineers thought about, in every tiny aspect. I think the big “aha” moment for me was a day when I was replacing a burned-out turn signal bulb. I’ve done this job on two other (modern) cars I’ve owned, and it usually involves a socket or two, or a Torx driver, and a lot of fishing around inside tiny cavities. On this car, you reach inside the engine compartment, unscrew a knurled plastic knob with your fingers, and the entire lamp assembly slides out for easy access. Another time I needed to access the fuel sender. It was easily removed with only two tools, and when I got it apart I was amazed to find it was constructed of stainless steel with delicate gold wires, still accurate after nearly three decades. (The tank level monitors on my Airstream have never been accurate.) Everything in these old Mercs is like that; finely engineered, built to last, and yet repairable when necessary. In 1984, this car would cost you $31,940. For comparison, I was still in college in 1984, and my landlord offered to sell me the condo I was renting for $32,000. The year after that my greatest aspiration was to buy a Nissan Sentra with optional air conditioning that cost about $7,000. It was a mighty sum to me, something that required signing my first finance contract. The price of a Mercedes 300D was unfathomable, and the car was intimidating in its vast superiority to the econobox I hoped to drive. It tickles me to ride in one today, finally getting my chance at the sweet and soft ride that somebody with eager anticipation plunked down a small ransom to get in 1984. My hunt this time took a bit over two weeks, since I started before I mentioned it on the blog. The process is occasionally tedious and requires diligence in searching online sources like Craigslist, Autotrader, Cars.com, eBay; in other words, it’s absorbing. Blink for a moment and you may miss out on the car you’ve been looking for, after all hundreds of other people are likely looking for it too. I drove to every local European car repair shop and put in a word about what I was seeking, I told my friends, I studied reviews and forums, and I stayed up late browsing. The rest is just a matter of perseverance. After a couple of weeks I was tired of looking at the junk cars that comprise 95% of the market, but I also didn’t want to end the search too early. The problem, as I told Eleanor, is that it’s like a dog chasing a car. What happens when the dog catches one? There were a few near-misses. I spotted a car in California that looked great, but upon digging into it I discovered that it had failed emissions four times in recent years, and that the seller had repainted it and bought a lot of used parts to make it look like new. Those are all red flags. Many others featured things like “good A/C but needs a charge” (which means bad A/C), and “fresh repaint” (which means cheezy repaint), and “no visible rust” (which means rust in inaccessible spots), and my personal favorite: problems excused with the explanation that “all these cars do that.” No, I found myself mumbling to myself after a long evening of browsing online ads, only the neglected ones do that. My ideal prize would be as unmolested as I could get, original paint, unrestored, just as it was was left by a loving owner who regretfully was letting it go after many years of gentle use. This might seem to be a fantasy, but if you are willing to pay market rates and be patient, there are a lot of such cars coming up for sale. The owners who bought them in the mid-1980s and never drove them in the winter are now reaching an age where owning an old Mercedes no longer makes sense. One by one, these cars are coming out of storage barns and garages all over the US. That’s what I was waiting for. I finally found it, or something close enough. It’s a 1984 Mercedes 300D, in Thistle Green Metallic paint with a Palomino interior. Two owners, 101,000 miles (anything under 150k is considered low mileage for a car of that age), everything works, everything original except the radio, and no rust. That’s just 3,600 miles per year, a good indication that the owner stored it in the winter. The car was in Maryland, so I had some long conversations with the seller, studied his photos carefully, checked his references, and ordered a pre-purchase inspection at the local European car specialist. Everything checked out. The ultimate would have been to fly out there to get the car. This is always a great adventure and an opportunity to bond (and learn the car’s quirks), but the trip would be at least 2,300 miles and my schedule didn’t allow the time. So I’m having it shipped to home base. I have something to savor while I’m waiting: the seller sent the car’s documents ahead via FedEx. Getting this package was like Christmas in July. Typically, the owners of these cars save all the crucial historic documents, and this one was no exception. I have the original window sticker, the dealer’s pre-purchase inspection sheet, the owner’s manual, maintenance booklet, warranty documents, and receipts for services. From this the low mileage on the odometer can be confirmed as actual mileage, and I know what maintenance services have been left undone. Even a pristine-appearing specimen has issues. There are no perfect cars from 1984. You have to expect some amount of “sorting out” to be done in the first year. It’s process in which the car gradually gets brought up to spec until it works as it did when it rolled off the showroom floor. Of course you want to start with a car that’s worth the investment and doesn’t have too many expensive problems. For this car, the sorting-out process will begin right after it comes off the truck next week, starting with safety-related items and replacement of all the old fluids. I guess that’s what happens when the dog catches the car. He sits down and begins to gnaw on it like a bone. Or else maybe the dog gets a driver’s license and starts enjoying his new ride. Either way, the game may have only just begun.